The book includes 90 top-rate photos of Lambrettas, all recent shots of restored or carefully-maintained bikes, not “period” photos. The pictures are a good bit less “staged” than those found in the “Colour Family Albums,” which often featured odd (to American eyes, anyway) characters in odd settings. For the most part, the scooters are the stars. The text is somewhat uninspired, apparently assembled from the usual sources without any great deal of fresh insight. Those moderately familiar with the history of Lambretta won’t learn much from this book, though a newcomer to scootering would glean enough to hold his own in conversation at a scooter rally. The typesetting and design is equally uninspired, but the sparse design at least serves the photos well. Along with the lack of in-depth information comes a few confusing bits of text, and incorrectly-captioned photos, for instance a Starstream 125 badge is out of place on a spread dedicated to a TV175. The organization of the book is confusing, as well, jumping back and forth through history and around the world, probably a result of the text having been written around the available photographs. Most befuddling is why the book is called “LI Series Scooters” when a good third of the scooters pictured are not LIs. One could argue that GP/DLs and/or TVs are similar enough to the LI, but the many pictures of mopeds, minicars, and pre-LI models definitely stray from the alleged scope of the book. Just about everything but the Cento and Vega ranges is covered. 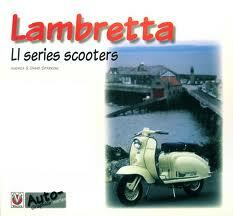 Lambretta fans will enjoy all these photos but it makes one wonder about the title. These faults are minor, though, as the meat of the book is the photography. It’s quality stuff, there’s a wide variety of photos, and plenty of inspiration for paint jobs and customization, not to mention ideas for improving your own scooter photos. This is a book for your coffee table, especially if your coffee table is in your garage, or you work on bikes in your living room. The photos are very good, and worth the price. If you’re the type who buys every scooter book you can get your hands on, you’ll enjoy this book, even though it’s not essential, it makes a worthy addition to any Lambrettista’s library.